With their latest record ‘Stateless’, Brighton-based band two-piece Tenek have created a solid and soulful tribute to electronic rock music. On the opener ‘Breakdown’ the band blend the emotion of Mesh within the danceable pop hooks of The Chemical Brothers. Evocative lyrics brush up against screeching synths and bouncing electro beats. Next up, ‘Submission’ creates an ambient backdrop for some fantastic guitar work and uplifting synths which contrast with some standout angst-ridden and reflective vocals. ‘If I Should Fall’ meanwhile hits harder with some serious shredding and pulsating Industrial rhythms – it’s a powerful and dark ode to devotion and love that leads nicely into ‘Where is The Time?’. This is an affecting rocker that will lull the listener into a false sense of security with soothing tones before some seductive beats kick in about 2:40 minutes for a trippy and progressive electro-rock anthem. ‘All The Same’ strikes next and it’s fast pace offers up a real contrast to previous material on the disk. Here you can readily see the influence of The Crystal Method within the hard-yet-intelligent electronics which contrast nicely with the melodic vocal stylings. ‘Fatality’ fires off next, and it’s a soft and touching electro track that draws inspiration from the likes of Portishead. There’s an attractive, spacey ambience to this that will most certainly conjure images within your mind and transport you to a better time. Dirty synths crash in at around two minutes but this certainly doesn’t detract from the great impact of the tune. In contrast, ‘I Don’t Cry’ is a personal and dance-led tune that would certainly go down well with the EBM and Goth crowds. Everyone will be able to find something to identify with on this track and as such it has the most appeal of all the tunes on this offering. Meanwhile, ‘Less Is More’ attacks the senses like a totally addictive cyber virus that will infect the senses and engulf the soul in a cuccoon of cables and wires. This is probably the track where Tenek display their diversity the most. The tone changes a few times on this one but the music remains tight and each change of direction fits together nicely. ‘State Of Mind’ features all the emotion of VNV Nation and contrasts it with the darker sounds of Zeromancer. It’s a definite synth-pop track but it’s got a sinister undertone that is embedded within the lyrcs and the overall beat. 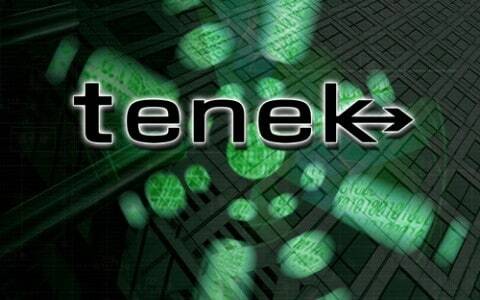 Tenek seem to be all about contrasting sounds and ideas, mixing emotive and hypnotic vocal elements with poppy beats and the contrasting that with darker Industrial beats and themes that chronicle the more challenging parts of the human experience. The synth-driven title track ‘Stateless’ is again very different to previous tracks as it incorporates the more dance-orientated tastes of the group. There’s flashes of everything from Faithless to The Chem Bros via The Human League. It’s time to get your glowsticks out people! The album’s final tune is ‘Sombre Friday’ and it’s a proud ending to a seriously chunky body of work. Taking inspiration from Gary Numan at his most progressive and introspective Tenek will drive their point home and make a mark on your brain without even having to say a word. This is addictive and chilled out electronic music that will cater for those with a taste for both the light and dark sides of the modern electro spectrum. In short, it’s beautiful synth noise that you can’t afford to sniff at.